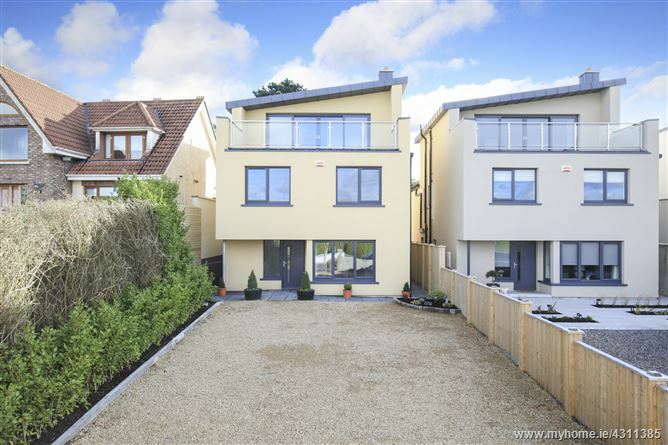 Located at Howth Summit, this new build modern detached house come to the market with a high level of specification throughout. The property offers a combination of modern and traditional design with generous living accommodation spread over two floors with an additional reception room at second floor level including a roof terrace with unobstructed 180 degree panoramic sea views. Accommodation comprises an entrance hall, guest WC, utility room, lounge, large open plan kitchen through to family/dining room, 4 bedrooms with 2 en-suite, a family bathroom and roof top living room with terrace. Each property comes with off street parking to the front and generous landscaped gardens to the rear. The property has a south east facing rear aspect and bounds the protected lands of the Howth Special Amenity Area Order. Contact JB Kelly at 01-8393400 to register your interest. Tiled floors from entrance lobby through to spacious hallway. Tiled floors and range of storage cupboards and wall mounted units. Plumbed for washing machine. Large open plan space with dining area and family room separated by a fully fitted high spec kitchen with room dividing counter. Neff appliances including oven , wide induction hob with extractor unit over, fridge freezer, dishwasher. Family room to the rear wth glazed door to private patio and sunny rear gardens. Accessed by feature oak staircase. Walk-in hotpress / storage closet. Double bedroom to the front, with sea views. Ensuite comprising WC, WHB and cubicle shower - tiled walls and floors. Double bedroom to the front with sea views. Large double bedroom to the rear, overlooking landscaped gardens. Large multi purpose room, plumbed for en-suite (if required). Stunning sea and island views from large floor to ceiling windows and sliding glazed doors. Roof Top Garden - 22 sq.m. Engineered non slip decking with glazed balcont and chrome handrails. Stunning sea views from Irelands Eye across to the Malahide coastline and beyond.